I’ve always assumed that television viewers watching M*A*S*H on March 18th, 1975–that’s when “Abyssinia, Henry” was originally broadcast, for those of you who haven’t memorized air dates–were completely unaware of what was in store for Colonel Blake at the end of the episode. After all, the bulk of the cast and crew had no idea that Larry Gelbart and Gene Reynolds had decided to have the character die after his plane was shot down until just before they filmed the final scene. Based on everything I’ve heard or read over the year, it really does seem like most people truly were surprised by the shocking turn of events. But just how much of a secret was Colonel Blake’s death? 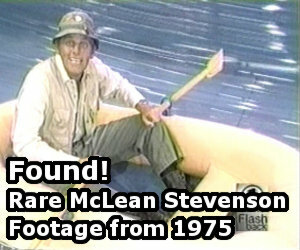 I started thinking about this last week while researching McLean Stevenson’s reported cameo appearance on The Carol Burnett Show. How could that series, which was taped in front of a live audience two weeks prior to broadcast, have included a segment in which Blake survived the plane crashing into the ocean, if nobody knew about the character’s death? Certainly, Stevenson and the rest of the cast and crew knew. CBS and 20th-Century Fox executives no doubt were aware as well. And the episode was filmed long before it actually aired, so there was plenty of time for the new to come out. Earlier this month, Rob Kelly posted a scan of a newspaper article from the night “Abyssinia, Henry” was broadcast, which basically revealed that Colonel Blake would die by writing that “the ending is a la Mr. Roberts.” If you’re familiar with the play, novel or film Mr. Roberts, you’ll know what that means. The article was published on March 18th, 1975, the day the episode aired. So anyone looking at television listings and reading the summary for the episode–and also knew what happened to Mr. Roberts–would have had the episode spoiled to some degree. “MASH” celebrated the completion of this season’s shooting with a cast party at 20th Century-Fox late last week. All the cast and crew were on hand — except for McLean Stevenson, who celebrated his permanent departure from the company by not attending. He left the soundstage as soon as the final camera “cut” was called. I can’t say how widely syndicated Beck’s column was in 1974 or how many people read it, but anyone who did knew exactly what to expect five months later when “Abyssinia, Henry” was broadcast. Whether anyone remembered reading about the details of Colonel Blake’s death after all that time is another matter. Also, based on the publication date for Beck’s column, it is likely that the final scene was filmed on Friday, November 8th. 1 Stiff, Robert. “M*A*S*H Colonel Goes Home.” Evening Independent (St. Petersburg, Florida). 17 Mar. 1975, city final ed. : 1. 4 Beck, Marilyn. “Hollywood Closeup: Susannah York Comments on Change in Attitudes.” Milwaukee Journal. 13 Nov. 1974: 13. Great post RJ! I am really surprised how the ending to the season “leaked” so early. I was also unaware that the episode of Carol Burnett was filmed before the airing of the finale. Great piece of research! Well, there always was that speculation that it really wasn’t Larry Gelbart and Gene Reynolds who decided to kill of Henry, but the network to ensure that Mac wouldn’t change his mind about leaving, because they had it with him. Has anyone seen that show The Truth Behind the Sitcom Scandals? It was done in 2000, I believe, with interviews with Wayne Rogers, Loretta Swit, Larry Linville, Gary Burghoff, and Mike Farrell, with them offering insight into the controversies that surrounded the show, including Henry’s death; Gary mentioned how Mac always stood up for those on the set who wouldn’t complain, because the actors were always working under such horrific conditions, especially on the Fox Ranch (Loretta even said a crew member or extra nearly died of heat exhaustion one day while filming). There’s also contradiction among them, because Gary said the reason Mac left was mostly because of the working conditions, while Loretta said Mac said to her at one point, “I don’t want to be number three, I want to be number one” and left to find more starring TV roles. So again, was Henry’s death really to show the horrors of war, or a ploy by the networks to ensure they wouldn’t have to put up with Mac again? I believe they had Gene Reynolds on the show as well, who ensured them that they did it to show that not everyone got to go home to Bloomington, Illinois, after the war. But there were some other interesting subjects they touched on: network scrutiny (mainly over the sexual content and jokes), the lawsuits against Wayne and his counter lawsuit against Gelbart and Reynolds, Linville’s departure, Gary’s male-diva behavior on the set leading to his departure, Loretta wanting out for Cagney and Lacey but the network wouldn’t let her out of her contract. BDOR, unfortunately that is one of the few M*A*S*H specials/documentaries I have not seen. Wow RJ, what an interesting article! It’s pretty crappy how things like Henry’s death can hit the media and spoil the ending, especially that one article from the end of ’74. It totally takes away from the shock factor the viewer receives from watching the episode. And Big Daddy makes an important point: They let all the other cast members who wanted to leave out, so why didn’t they do it for Loretta? Maybe it’s because they didn’t want her to leave their show just to go be a lead star in another. Cagney and Lacey was also on CBS, so it couldn’t have been just to stop her from jumping networks. Also, not that it means much, but if Loretta left that means Alan Alda, William Christopher, and Jamie Farr would be the only original cast members remaining (even though Christopher wasn’t in the pilot), though I doubt that had much to do with it. – Abyssinia Henry was shot on November 1, 4, and 5, 1974, which means the date of Marilyn Beck’s article makes sense. What made me doubtful and is a bit unusual is that season’s generally wrap in Feb/March, not in the prior November. However, I checked a production schedule and that is the wrap date for that season. (That season also started shooting in May, which is unusual). As for the Carol Burnett “insert,” if it were shot today, that scene would have been shot without a studio audience and inserted with a laugh track into the appropriate episode. I’m guessing that is what happened, assuming that shot did actually occur (and isn’t an urban legend), because air schedules move around and it would be easy to cut a 30 second segment into any show after-the-fact. Hope that is helpful information. They were shot roughly July – February, except for that season, which was shot May – November. I don’t have a good explanation – there was no work stoppage due to a strike, which did occur later in the series run. The following season was shot roughly July – Feb. It shouldn’t have matter to Mac – he was leaving the series and his new series would have followed a similar calendar template, unless it was a midseason series. Where do you have a copy of the MASH production schedule? Is this available anywhere online? Even the latest MASH book that I bought didn’t have this, so I would find it very interesting. I do have a copy of the script for “April Fools”, which was the last episode aired in S8 (I think “War Co-Respondent” & “Back Pay”, which aired earlier in March 1980, were filmed after it. ), and the date on the script was Jan. 8, 1980, so it was probably filmed late that week, maybe Wed. 1/9 to Fri. 1/11. I also recall a picture from The National Enquirer in July 1979 that mentioned that MASH had started its filming for the S8 the previous week (July 9-13, I think), so filming occurred for S8 most likely entirely between July 1979 & Jan. 1980. Thanks for mentioning my post! That newspaper article really threw me when I saw it–interesting to know there were other possible “spoilers” out there. The only evidence I ever encountered of an alternate ending scene ever being shot was in a direct conversation I had with Gary Burghoff back around the spring of 1995 when he was doing an art exhibit in Des Moines, Iowa (first time the guy who played Radar had ever been in Iowa, he said). Gary told me that they had already shot a different ending when the cast was given that famous final page of the script. (First time I’d ever heard of this, and to confirm I’d heard this correctly, I asked him back: “They filmed a different ending before the other one?? ?”) Gary said that, when he saw what was on the final page, he told McLean that he wouldn’t read the lines if McLean didn’t want him to, but McLean told him to go ahead and read the lines they had just given for Radar because McLean felt that this final scene is what the series was really all about. But on the other hand: When Loretta Swit was at the Hollywood Collectors Show in 2002 (…and THAT is a whhhhole other tale in itself…. ), I asked her about what Gary had told me about an alternate ending being shot for that episode, and she told me that there was no other ending that had been filmed for that one. It was reported in “People” magazine the week before he left that Henry Blake would be killed in a helicopter crash. It was a cover story on Alan Alda in early 1975. On another note, a year before “The Empire Strikes Back” was released, “People” reported it would be discovered Darth Vader was Luke’s father!!! And yes, I know he was shot down in a plane, not a helicopter, I’m just quoting Dawson. no! i don’t think so! that he was the deal! but yeah it’s strange to know why he died in a plane! and not in a helicopter!